This month I had the great privilege of interviewing Michael Spreeman, owner and founder of Ravenscroft pianos. They are a new addition to Piano Price Point. You can find their listings of pianos in the manufacturer index. It’s always great to hear inside the minds of piano makers and designers – why they do what they do. Hope you enjoy this talk as much as I did. When was the company officially launched? MS: The official date… we opened the Scottsdale Studio in 2004… wow, that was nearly a decade ago. Time flies when you’re having fun as they say. There are so many great piano companies in the world. What was the initial inspiration to build a piano, to create something that had never been done or rather, make your mark on the industry? One of the motivations for starting SPI/Ravenscroft Pianos was the re-design I did for Bob Ravenscroft.. and yes.. there was also a frustration with what I was seeing in new pianos. In addition to rebuilding and concert work, I was also doing a fair amount of “new piano prep” on high-end pianos. What if I, as a technician, were to build my own pianos?? And… yes.. yes..exactly..I know… WHO in their right mind would even consider starting a piano building business in a declining market!?? However I knew I could do better… and yes… it was (and is) a quantum leap from technician to builder. But as a technician, I wanted to create something unique, not so much something that had never been done before but rather, a performance piano that would do what the numerous artists I’ve worked with have been telling me that THEY want a piano to do: to offer them a broader spectrum of color and dynamics than they’ve ever experienced in order for them to better convey their musical message, that would encourage and allow them to do things they couldn’t do on other pianos… a piano that would minimize the mechanical interface in order to maximize the efficiency of their expression. And then as an Artist, I wanted to do what I do for ONE reason and ONE reason only ~ to present the very finest customized, hand-built instruments that we absolutely positively can to concert venues, pianists, and enthusiasts… to raise the bar for all performance instruments. I also wanted my small company to be different than the large manufacturers. Regardless of how many or how few pianos we can make in a year, it is simply not in our DNA to sacrifice on the quality of any of the thousands of components that make up a performance piano. As a limited production builder we do not have the manufacturing constraints that the larger more well known companies do. Our industry is challenged, it is unfortunate, but many of the old great piano manufacturing companies around the world are gone or have had to sacrifice quality to meet a declining price point. But our mission is to build elegant, responsive, pure and powerful grands that are unique and extraordinary. What’s your background in manufacturing? I don’t have a background in manufacturing. Rather, I began my training from the best in our industry, the technician side of piano RE-making, RE-building. Early in my career as a Steinway tech I loved that bold NY Steinway ballsy sound! As years went on, I rep’d Yamaha as a National Technical Consultant and Concert Technician working with many of their top performance pianos and artists. I so appreciated their clarity and articulation, something they are renowned for…. eventually I worked with a top US Fazioli dealer who also sold several other European based pianos. This helped formulate my taste of the European’s purity of tone. Bluthner, Bechstein, Fazioli, Bosendorfer, Steinway… why are we not playing a Spreeman? What’s the story behind crediting Ravenscroft? You know Glen, that’s a cool story… I actually decided to create my collection of Ravenscroft limited edition pianos because I was …well….ready….after spending those 30 years learning and practicing the craft. I was a concert tech preparing performance pianos for well-known artists, and actively rebuilding numerous high-end production pianos. Back in 1994, jazz musician and composer Bob Ravenscroft commissioned me to completely redesign and rebuild a grand piano that could produce a specific sound to fulfill his well-known free jazz style. I named this growing collection of grand pianos to honor Mr. Ravenscroft… based on that first successful project. What are some unique features that characterize Ravenscroft design? I think I know what you mean by the word “Features” …but I am a builder, so it is one of those words that I hear sales guys use as “providing the sales staff with something they can differentiate their product from another in order to increase sales”, LOL. My impression from the top performance artists who visit our Arizona studio and whom we get to enjoy at NAMM every year is that …. 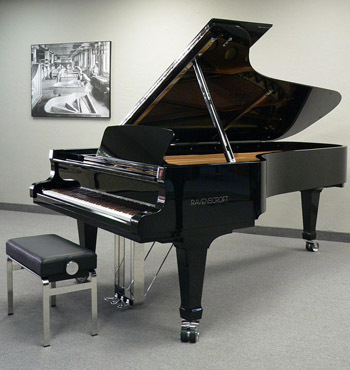 most manufactures are designing or building what the “company” chooses to present to the pianist. This is not at all my approach. Rather, I am free to design and build what the artists are telling us …what they want. Nearly every aspect of my business and our collection of pianos are different from the norm. For example, one custom build with individualized custom hardware to match the clients architecture,… the one-off scale design to obtain a distinct sound for just one customer,… the 1000 year old Sitka Spruce chosen for a specific concert instrument and harvested just for the production of musical instruments, …or just our relentless pursuit of quality in every single piece of the instrument. Come to think of it, there’s very little we do that would be deemed “normal piano making” by any standard. It takes a lot of hours and a lot of passion to build an instrument that when finished and cared for should be around for 2 or 3 generations! How has CAD (computer based design) optimized your custom made Renner actions? We, the audience, experience the piano from an audio perspective, but the artist has to make a mechanical interface through the keys and action of the piano. Therefore my goal with all of the Ravenscroft pianos is to make-possible and facilitate an emotional connection between the piano, the pianist playing the Ravie, and the music being produced…hopefully to a level that they merge and become one. It’s from this creative space or zone that an artist can express their thoughts, ideas, and emotions through the instrument. We strive to make this wonderful connection as invisible as humanly possible. For example, our actions are individually CAD optimized to each and every piano before they are ever assembled. This provides a custom geometry configuration that is precise to the piano. The “down weight”, or amount of force necessary to initiate motion in the key, is a controllable variable and is critical to the evenness and performance of the action. We actually weigh-off each key to 1/100th of a gram in a specialized CAD program, which results in a real world tolerance of 1/10 of gram. Most factories only have the time to work within a 3 gram tolerance. Every pianist who enjoys playing the Ravenscroft notices this and comments on this attention to detail and how it has an enormous impact on their experience …because of the evenness of the touch from note to note. This is an incredibly time intensive procedure that we feel results in the finest performance action we can possible present to the pianist. What’s your philosophy of tone? Where does it come from? One very important starting point for me is evenness of tone and volume across the entire keyboard. So many high-end concert pianos that I’ve worked on tend to have uneven or weak areas somewhere in the scale. This can make intimate expression of phrases difficult for the pianist. 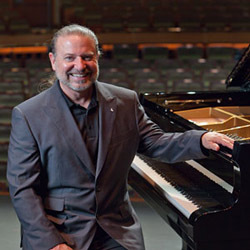 Throughout my career, Steinway tech… Yamaha National Technical Consultant and Concert Technician, Fazioli support and setups…those experiences combined with years of input from artists, …I decided my quest was to attempt to create a hybrid tonality… my ‘best of the best’ as it were. A philosophy of tone, as you say, that has the warmth and purity of the fine European pianos, the harmonic complexity of the older great American pianos, that clarity and articulation of the great Asian pianos, then….from there…to ensure our design has it’s own unique colors with enhanced duration and as broad a spectrum of dynamic expression as is possible. Although our sound is very clean and pure, it’s also multidimensional. I strive for multiple layers, or dimensions, of complex harmonics that can be heard, sensed, and felt without sacrificing a strong emphasis on a bold fundamental tone. What elements would you like to focus on in the future and are there plans to expand the line? 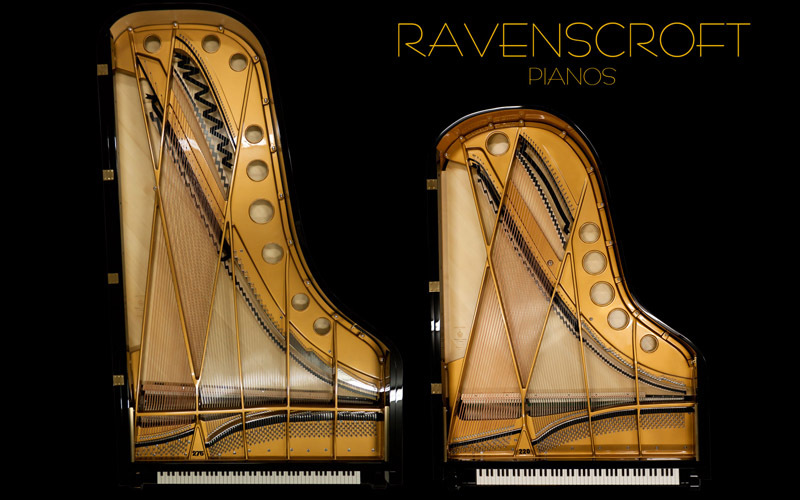 As more and more people get to sit, play, experience, and dream of owning a Ravenscroft…our focus will continue to be on the limited editions of a quality instrument, second to none… yet, we are always challenging ourselves on how to advance the aesthetics, the feel, sound and performance of our pianos. As demand for our pianos inevitably increases, we will expand to meet our customers’ requests…. within reason….without ever compromising our commitment to them and our quality standards. We will build the finest possible finished product we can create. BTW, we are excited to be releasing a new product at NAMM this year (Jan 2014), unfortunately I can’t yet share the details…. But stay tuned! Your pianos have received world acclaim. What was the first moment you realized that you created something that made you smile? I don’t smile until the artist smiles…or cries, often times right in our Scottsdale Studio. Those are the magical moments……the moments of truth… where passion applied to our work for our clients is affirmed… and suddenly it’s all worth it. Before signing off, I just wanted to thank Michael Spreeman again for doing the interview and to leave you with more media – check out Ravenscroft video page for samples. And for some eye candy, click down for a beautiful shot of their two grands taken from top down.